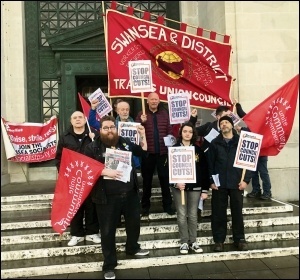 Swansea Trade Union Council lobbied the Swansea Council budget-setting meeting on 28 February, alongside Socialist Party members and trade unionists from across the city. The Labour administration once again waved through tens of millions in cuts to jobs and services in Swansea, while praising itself for a job well done. Our history of protesting at these meetings has had an obvious effect. The council moved the start forward to 3pm, effectively cutting off participation from most working people. The council also attempted to undemocratically fill the public's ten-minute question time with predetermined questions - including one scaremongering about the "dangers" of not setting a "balanced budget," a direct attack on our call for legal no-cuts budgets. Our call though was echoed, however, from the public gallery, by a local government workers' representative from public service union Unison, who called on the council to set a no-cuts budget in line with Welsh Trade Union Congress policy. Socialist Party member Alec Thraves also spoke. He called on the council to fight austerity, and not make the £24 million cuts or sack the 145 teachers and 126 social care workers as set out in the budget. This garnered cheers and applause from the public gallery. The budget was passed and the cuts and job losses are set to continue. But activists on the ground are commuted to fight every one, and continue to challenge the right-wing Labour administration in its participation in the Tories' austerity agenda.